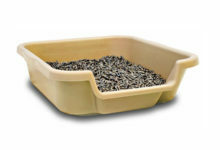 My arthritic 13 yr old cat has been pooping on the floor, so my vet suggested I get her a litter box with lower sides to make it easier for her to get in & out. I was surprised at how difficult it was to find a good shallow litter box. A woman on some forum suggested the PuppyGoHere pan. I ordered two, which arrived in just two days! 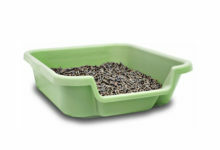 The quality of these litter pans is by far the best I’ve ever seen – absolutely outstanding!! They are thick & sturdy & extremely well constructed. I’ve had cats for over 40 years & have never seen any made this well. I’ve ordered others online that arrived cracked or shattered. No chance these will crack. 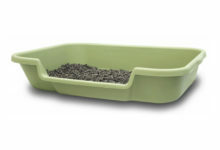 I hoped they wouldn’t be too small because the desciption says ‘miniature’ litter pan, 20x24x5. I was pleasantly surprised though that they were quite sufficiently large enough, and just the right height. I’d like to suggest to PuppyGoHere that they consider removing the word ‘miniature’. On a scale of 1-10, these are really off the charts. I’m not one to do reviews, but PuppyGoHere deserves praise for making such a superior product. I’ve never been so thrilled about a litter box! !